Powerfully efficient, the SH series covers more ambient surface area than its competitors, all at 120 Lumens per Watt. Models starting at 15,600 lumens, the SH series is a high output light engineered to cast light over a 275° area in large buildings, warehouses and factories. The lightweight, aluminum hinged bottom mount makes install a snap. By designing these with a focus on ease of installation and maintenance, you will save time and money. With over 125 Lumens per Watt, our high quality, high output LED chips are combined with a LG-Innotek driver. 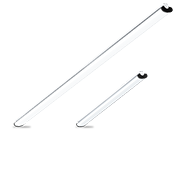 This allows us to deliver low-energy and low-heat output to maximize the life of LEDs. The SH series provides up to 18,000 lumens of consistent, bright light. 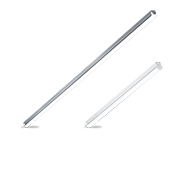 An extruded aluminum housing provides strength and is still lightweight. A full length wire channel allows for end-to-end wiring. The UL Listed junction box design leaves plenty of room for connections. The SH series is designed to cover a lot of area with a lot of light. LEDs are positioned to produce 275° of evenly distributed, bright light. The SH is perfect for a variety of commercial lighting needs. The impact-resistant frosted lens eliminates bright spots that can cause glare and eye discomfort associated with direct lighting. 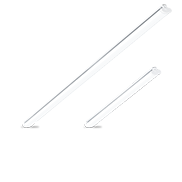 The SH series features a completely sealed fixture, which prevents dust and debris build up inside the light. The smooth, frosted lens makes the exterior easy to wipe down. Standard replacement drivers are available for future needs, unlike most other lighting products.